FULLY ADJUSTABLE SPEED ROPE - 10ft Cable that is Easily and Quickly Adjustable to your Desired Length within Minutes. Appropriate for Adults, Men, Women, Children, Kids, Boys and Girls. Thumb Screws Allow for Simple Adjustments, or You May Cut the Rope to your Desired Length with a Pair of Wire Cutters. EXTRA ROPE AND CARRYING CASE - Jump Rope Comes with an Extra Rope for a Friend or Significant other that wants to keep the perfect rope length to meet their needs. Comes with a free Fitizen bag. Take the rope anywhere without worry. 90 DEGREE SMOOTH HANDLE TURNING - Ensures Fast Spinning - No Friction - No Tangling like the Typical Long Ropes. Perfect for Double Unders, and Even Triple Unders. Practice Makes Perfect. MADE FROM HIGH QUALITY PARTS - Our Jump Ropes are Made with High Grade Steel Components that will have you Jumping Faster and Much Longer. Our Ropes are Made from High Quality PVC that will Never Frey or Tangle. This Rope is Sure to Outlast the Others. EASILY PORTABLE - Compact - FITIZEN Carrying Case Included. Always Keep your Jump Rope on Hand for a Quick and Effective Workout. 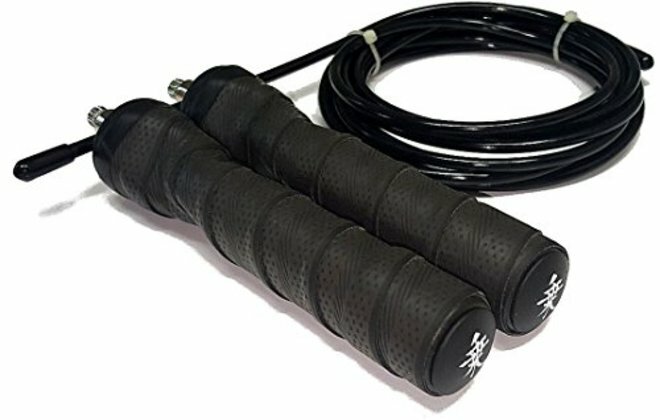 The Jump Rope is One of the Oldest Cardio Tools still being Used by Top Atheletes in the World Today. Safely Speeds Heart Rate to Burn Calories and Build Endurance. A Must Have for Any Serious Athlete.